The long body, very long wings, short legs, small rounded head, and thin short bill only work for one group of birds and that's swallows. And if you think you're seeing double you are; there are two birds in the photo. Both birds appear to be the same size and shape so we'll assume for the sake of this quiz that both belong to the same species. We'll concentrate on the front individual since we can see more of it. Most of the underparts of our candidate look whitish, but the chest and throat look darker. Tree, Violet-green, and Bank Swallows have clean white throats so this bird can't be one of these species. Northern Rough-winged Swallows have a brownish throat and chest but lack the pale spot on the side of the head of our bird. This pale spot also eliminates Barn Swallow. Also, the whitish underparts don't look right for Barn Swallow. How about Cliff and Cave Swallows? 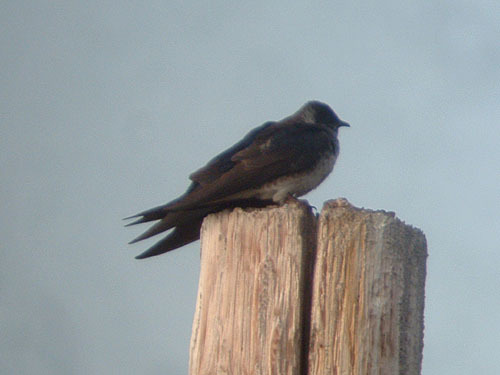 An adult Cliff Swallow would show a pale forehead (Illinois Cliff Swallows at least) and fine white streaking on the back. We can see that our bird has a dark forehead and an unstreaked back. Juvenile Cliff Swallows are variable in plumage but most also have a pale forehead. Cave Swallows have a distinctive capped look not present on our bird, and wouldn't look as dark chested. So what does that leave? By elimination Purple Martin. This Purple Martin pair was photographed on May 19, 2007 at an unknown location.